Health care facilities use a large amount of disposable diapers, especially in retirement facilities, long-term care, hospice, intensive care, and neonatal units. In hospitals, diapers represent about 3.5% of all waste material; in retirement residences, they represent about 40% of all waste material. Because they are not reused, diapers are considered final waste and represent a significant fraction of landfill/disposal costs. 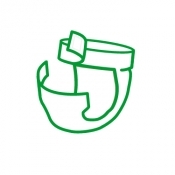 For 12 weeks in 2013, Lange Bleu, a social venture in Montreal, managed a pilot project about the development of washable incontinence diapers. They tested the project on four residents and ultimately demonstrated that it is possible to use washable diapers in a retirement home.